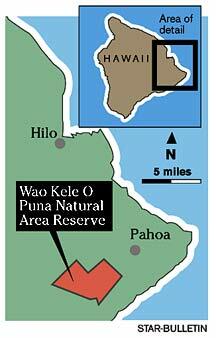 The Office of Hawaiian Affairs will now control a 40-square-mile native Hawaiian rain forest, Wao Kele o Puna. The land has been purchased by the Trust for Public Land-Hawaii for $3.65 million from Campbell Estate, ending a decades-long struggle to save an important native Hawaiian resource. The 25,856-acre property near Hawaii Volcanoes National Park had been owned by the state, but in 1986 the state swapped it for 25,800 acres in Kahaualea on the Big Island so that Campbell Estate and True Geothermal could drill wells for geothermal power plants. The plan drew the immediate protest of Big Island residents and sparked the creation of the Pele Defense Fund. About the same time the land swap was taking place, the state land at Kahaualea was covered in a volcanic eruption. Protests and the cost of drilling made the geothermal project unprofitable, and Campbell Estate had listed the property for sale. "We took a stand for this land two decades ago in the courts, and have never given up the fight to find a permanent way to protect this forest," Palikapu Dedman, president of the Pele Defense Fund, said yesterday at a news conference at the state Capitol. "It is home to tutu Pele and the deities of the fire clan. It provides the Puna Hawaiian families with food, medicine, wood and lei and replenishes the ground water of the Puna aquifer," Dedman said. Under the plan, the nonprofit trust will buy the property next year for $3.65 million, using $3.4 million in U.S. Forest Service Forest Legacy program money, obtained by Hawaii's congressional delegation. Title in the property will be transferred to OHA, which put up the remaining $250,000 to buy the land. While OHA will eventually be responsible for the land tract, the state's Land and Natural Resources Department will manage it after the sale. "The acquisition ... is intended to protect the natural beauty and cultural resources on the land," Haunani Apoliona, OHA chairwoman, said. Peter Young, director of the Department of Land and Natural Resources, said the geothermal wells on the property must be capped or filled, a project that is expected to take two take years and at least $1 million. Young said the source of those funds was still under discussion.